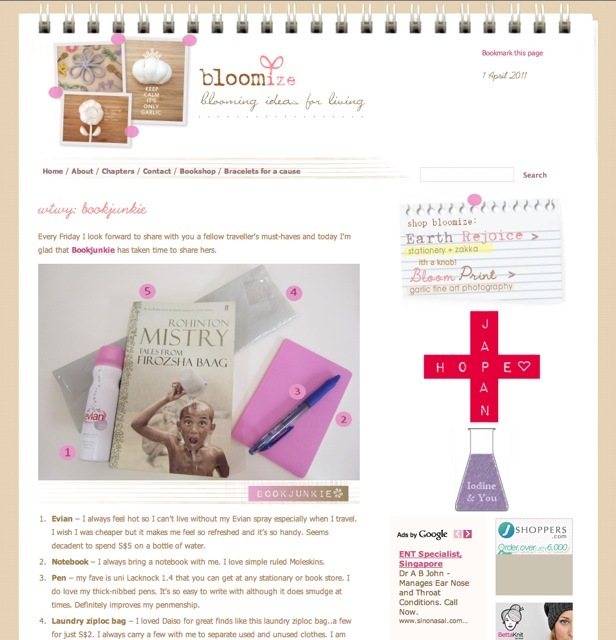 Bloomize is a wonderful blog you should check out. It’s by talented photo-journalist Clara who blogs from our very own Singapore. I am so glad I was invited to be featured in her segment WTWY or What Travels with You. It was exciting to see blog friends Kaho and Notabilia featured earlier too. This entry was posted in Featured and tagged beautiful, beauty, blog, blog friends, bloggers, Bloomize, Clara, culture, design, featured, Kaho, Life, Living, Notabilia, personal, photography, photos, pretty, shopping, Singapore, travel, travel essentials, women. Bookmark the permalink. I LOVE Rohinton Mistry. Glad you have discovered him. I especially loved ‘A Fine Balance’. Totally captivated from the start and was sad when it ended. One of my favorite books. Utterly beautiful. it’s one of those books where the characters just stay with you and you feel so much for them…. Yeah I read Kaho and Notabilia’s entries and am so happy you’re featured! I love reading the ‘What travels with you series’! It’s nice to take a ‘sneak’ peek into what others’ bring when they travel. Loving your pink Moleskine notebook – just my fave type of color! Haha too much stuff!!! But again, a really interesting post to do! 😉 Watch out! Wow that’s cool! You put your moleskine in a separate cover? I recall they are usually black. it now comes in all colours including 2 shades of pink and 2 shades of purple…very pretty. I do like the black as well though as it looks so classic.